The definitive guide to the country's hottest youth sports sensation as presented by Ron Filipkowski, the Travelball Select 2010 National Coach of the Year. Whether you're an experienced coach or a parent eager to help your child get the best experiences with a newly-formed team, you'll get everything you need from Ron Filipkowski's "Travelball: How to Start and Manage a Successful Travel Baseball Team". 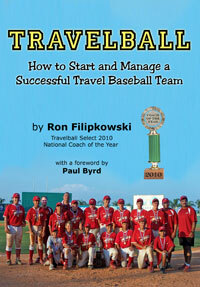 Filipkowski, named the 2010 13-U Coach of the Year by Travelball Select, brings more than a decade of personal expertise to this comprehensive handbook. He not only knows what it takes to keep a group of kids moving ahead toward top-level tournament goals-- he also shares amazing insights into the psychology of motivation and team management. Along the way, Ron Filipkowski shares unabashedly personal stories of his many experiences as the coach of a championship team. Some of his tales will have you splitting your sides with laughter; others will simply melt your heart. But throughout the book the author repeatedly makes one thing clear: if your team is going to be a consistent success on the baseball field, then you have to be at the top of your game when your players are off the field, too. While some travelball coaches may find themselves severely challenged by the competing needs of young players, demanding parents, petty rivalries, scheduling conflicts, hotel logistics, unethical competition, and all the other wild and unpredictable factors that go into the potentially overwhelming world of high-level travelball competition, Ron Filipkowski makes it all seem easy. Although "Travelball" features a massive amount of practical, hands-on information that will help you coach your team to peak levels of performance, this book doesn't stop there. Ron Filipkowski also takes you off the playing field, out of the dugout, past the locker room, and into the hearts and minds of anxious parents, overbearing tournament officials, and the umpires who never seem to get the respect they deserve. This is the real world of competing egos, unintentional goof-ups, and big-league stupidity that can make even veteran coaches pull their hair out-- and Filipkowski not only captures it elegantly in print; he also tells you exactly how to survive in this super-charged culture of crazy little things that all somehow make a big difference! If you're serious about being all the coach you can be, get this book and read every word. Then read it a second time, and keep a copy with you every time you get ready for a practice or head out for a tournament. And if you really want your team to succeed, make sure all your assistant coaches have their own copies, too! * Dealing with parents that are unhappy with playing time or positions. * How to handle and approach youth umpires to get them on your side. * Crazy little strategy tips that make a huge difference in travelball tournaments. * Why you should consistently treat each player different. * Creative offensive and defensive plays. * Recruiting new players from rec ball leagues and other travelball teams. * Tournament and game strategies adapted for travelball rules and formats. * Why doing things by "The Book" doesn't always work in the youth game. * Keeping other coaches from recruiting your players. * Managing playing time in tournaments to keep everyone happy while winning. * How to make travelball coexist with rec ball, school ball and other sports. * Baseball-specific strength, speed & conditioning exercises tailored for youth players. * Why home runs are evil in the youth game. * Why Bill Walsh-style practices are best for young players. * How to keep your team together over several seasons. * Teaching plate discipline and the mental approach at the plate. * The ethics of sign-stealing. * Why you should remove the word "umpire" from your team vocabulary. * Dealing with difficult parents of outstanding players. * Hosting tournaments as fundraisers. Sales expert Tom Post draws on his years of experience to share the secrets of professional selling to help you get big results so you can earn a top income. The Hatchery Manual for the Mike Sipe Survival System of Home-Based and Commercial Tilapia Farming - a practical how-to system for creating your own sustainable protein source to feed your family or to launch a commercial enterprise.